Will Netanyahu ever do anything at all about Iran? 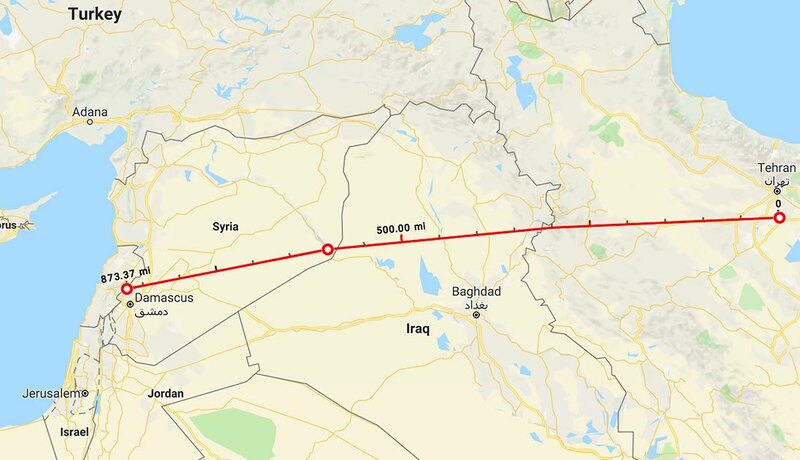 An Iranian military convoy has crossed into Syria through Iraq, possibly marking the launch of the long-planned road link between Tehran and Damascus, Iraqi officials and members of the military have told The New Arab. Military sources stationed in the border town of al-Baaj said that the convoy carrying troops from Iran’s elite Revolutionary Guards and the Iranian-backed Hashd al-Shaabi paramilitary crossed into Syria this week. “The cars were transporting Iranian and Iraqi forces to fight alongside the [Bashar al-] Assad regime. I believe this could signal the activation of the long-planned Tehran-Damascus road,” the official, who spoke on the condition of anonymity, said. He added that the forces included Iranian military advisors and commanders from the Iraqi Hizballah Brigades and Hizballah al-Nujaba forces. The route – which provides Tehran unhindered land access to its allies in Syria and Lebanon – was secured this summer. The land route is the biggest prize yet for Iran in its involvement in Syria’s six-year civil war. It facilitates movement of Iranian-backed fighters between Iran, Iraq, Syria and Lebanon as well as the flow of weapons to Damascus and Lebanon’s Hizballah, Iran’s main proxy group. It also positions Iran to play a prime and lucrative role in what is expected to be a massive rebuilding effort in both Iraq and Syria, which have been devastated in their ongoing wars. Understandably Israel has said in the past that it will not allow Iran into Syria, but it looks like that is just what is happening. This corridor would pose a grave threat to Israel, as it puts Iran right on their borders – whether be the Golan Heights, the Lebanese border, or the Mediterranean. This is a significant development in the Middle East and most certainly not a good one for Israel.